The BRUMMER name is byword for quality and craftsmanship. Trusted by the world's finest craftsmen for over 80 years, BRUMMER manufacture a comprehensive range of wood fillers and restoration products for decorative woodwork and furniture. BRUMMER adhesives contain a range of PVA glues that can be used both inside and outside the home. Specialist adhesives are available for wooden furniture and window frames, latex and acrylic products. They also produce a general purpose PVA adhesive suitable for bonding cement, concrete and wood. BRUMMER exterior wood fillers are used by craftsmen around the world to repair cracks, scratches, blemishes and holes in a wide variety of products, including garden furniture, window frames, greenhouses and even boats. 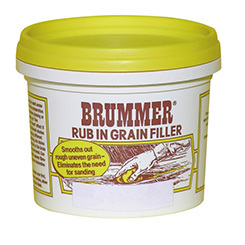 BRUMMER interior wood and grain fillers are available for a number of professional applications, including repairing scratches and holes in furniture, smoothing out grain on decorative wood, repairing doors and skirting boards and sealing wood before painting or varnishing. Brummer woodcare products are used to remove dirt and grime from furniture before finishing. They include knot sealers to seal knots in resinous timber and scratch covers to help conceal scratches and marks. Once prepped, BRUMMER also manufacture a range of finishing products to help protect wood from the elements, including linseed oil, teak oil and natural beeswax polish.